Taste test: These are pretty good thin chips, with green spots on them and a sweet onion flavoring. There's probably some sour cream in the taste too, but the onion is more noticeable. Smell test: Very mild but good onion and cream smell. Trivia: "Potatoes, Vegetable Oil (Cottonseed and/or Corn Oil), Salt, Non Fat Dry Milk, Whey, Dextrose, Sour Cream Solids, Onion Powder, Partially Hydrogenated Soybean Oil, Parsley, Monosodium Glutamate, Citric Acid, Artificial Flavor, Malic Acid." 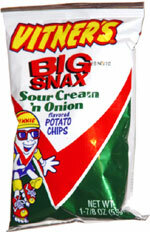 This snack was discovered by Jeremy at Walgreen's on North Michigan Ave., Chicago. Review published .